Sun Chips just announced that they’re going to discontinue their compostable bags. You see, their compostable bags were loud. Lots of people complained about the bags’ loudness. In fact, people were so dissatisfied by the noise from the bags that their sales dipped 11%. 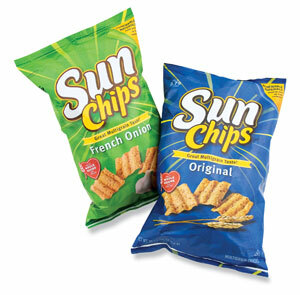 So Sun Chips decided to discontinue the new bags. This is why I hate people. People are stupid. People can’t see past the end of their own nose. People don’t think about the impact of their actions. A corporation finally does something to try to reduce the amount of waste we create and everyone rejects it because they couldn’t hear the idiots on Grey’s Anatomy because the chip bag is too loud. That shows you how shortsighted and unimaginative the American people are. You can’t put your chips in a bowl so that our children can live on a planet that isn’t covered in garbage? Plus, they’re watching Grey’s Anatomy. That show is terrible. In order to sustain life on this planet we have to make sacrifices for the good of our society. If people can’t find ways to deal with a little extra noise from their chip bag, why should we think they’re going to make the kind of sacrifice that will really make an impact? I missed this post on Thursday, but fortunately I caught it on the Round-up. I was appalled when I heard about this bag situation on WGN radio (yes, I listen to AM radio and I am not 90 years old). What was worse was they preceded this report with another report that people were suing the wind farm companies because the turbines were too loud. Seriously, what is wrong with people! They want to tear down the turbines and I am trying to figure out how I can put one in my back yard!